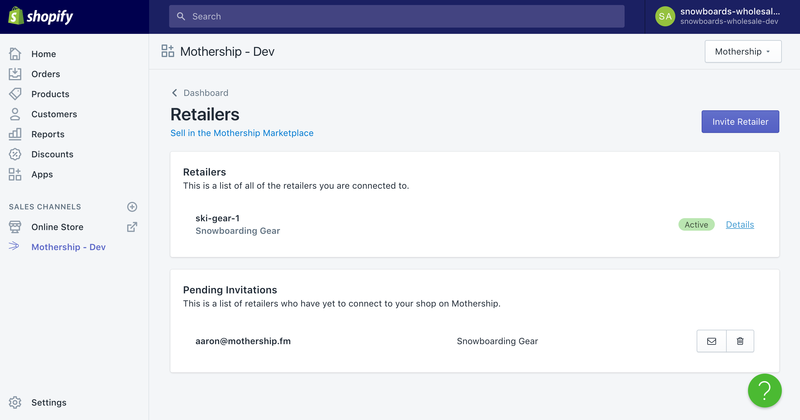 Retailers use our Shopify Mothership Connect app or our web-based Mothership Connect app to connect to your Mothership account. 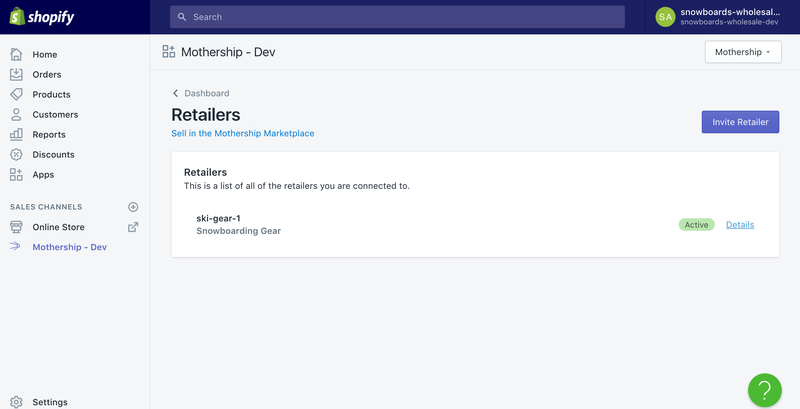 The free Shopify Mothership Connect app will automatically update product and inventory data in the retailer's store, as well as automatically place orders in your store when the retailer receives an order for one of your products. The Shopify Mothership Connect app can be installed from the Shopify App Store. For each one of your retailers, you assign them to one of your product catalogs. More than one retailer can subscribe to a product catalog, but a retailer can only subscribe to one product catalog. You assign the catalog to which the retailer is subscribed. 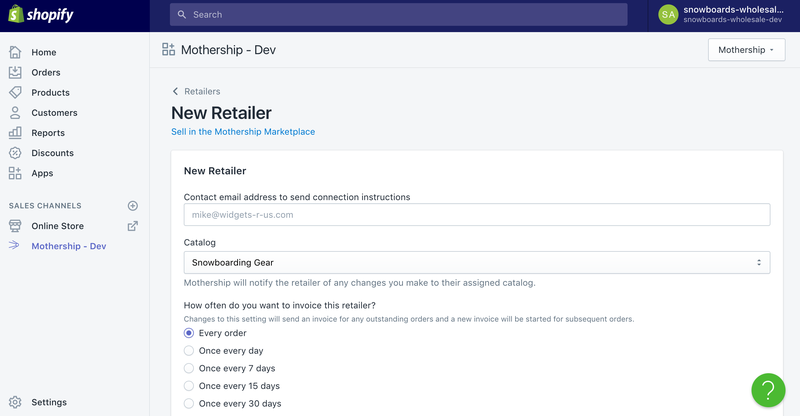 Mothership publishes your product catalogs as data feeds made accessible through an API or by downloading them. Retailers that use the web-based Mothership Connect app use the product feeds to populate their online stores. Mothership will automatically place orders with your store whenever an order comes in from a retailer using Mothership Connect. For API-based retailers, Mothership provides an API endpoint that allows retailers to place orders in your store. Retailers pay for their orders using invoices sent from your Shopify store. Remember, Mothership does not charge taxes on the orders your retailer places in your store. You should consult with your tax professional about your particular situation, but generally this means that you need to collect a reseller or wholesaler certificate from your retailer. First, go to the retailers page by clicking on the Retailers menu option from the drop-down menu in upper-right portion of the screen. If this is your first time inviting a retailer, you'll be taken to a screen similar to the one below. Next, click the purple "Invite Retailer" button at the top and fill out the invite retailer form (see image below). You'll need to specify the invoicing frequency and which catalog the retailer is subscribing to. As mentioned before, retailers can only subscribe to a single catalog. You can change which catalog a retailer subscribes to later. After you click the purple 'Save' button, you will be taken back to the Retailers page. This time, however, you'll see the retailer you just invited listed under the pending invitations section, like in the image below. 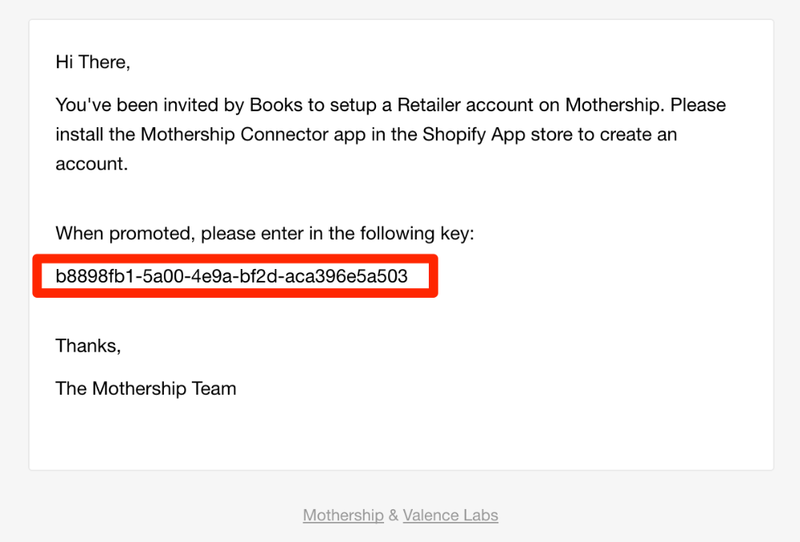 When you invite a retailer, Mothership sends them an email that contains a key (boxed in red in the image below) that the retailer needs to enter into the 'Connect with a new supplier' form in their Mothership Connect app. Once the retailer enters the code found in the email above, they will be able to import your products and place orders with your store. You will also see the retailer listed in under the retailer's section of the retailers page.